NBC and CBS were in a continual battle for Radio audience market share. From the mid-1930s forward, NBC and CBS regularly imitated each others' programming successes, in many cases simultaneously. Sometimes the listening audience was the beneficiary of the intense rivalry, sometimes, not so much. CBS' various experimental, often ground-breaking Radio innovations were some of the most cutting-edge programming to ever air during the Golden Age of Radio. NBC, for its part mounted a long-running series of educational initiatives with the various incarnations of their University Theater of The Air and NBC Presents productions. With the explosion in highly realistic crime dramas during the late 1940s and throughout the 1950s, both NBC and CBS went head to head trying to trump the others' 'true crime' dramatizations, with programming such as the wildly successful Dragnet series over NBC and The Line-Up series over CBS. But for many in their listening audience, the realism of Dragnet and The Line-Up didn't go far enough. The 1950s brought even more realism with the Night Watch series over CBS in the mid-1950s and the similar Unit 99 from ABC in the late-1950s. Indeed, within a year of Dragnet's first success over Radio, NBC took the Dragnet series to Television. NBC's Dragnet series over Radio and Television were airing during the same period for three years. Columbia, by contrast tried to emulate Dragnet's Radio and Television success with The Line-Up, but managed only one season of The Line-Up over Television. The clear winners in the rivalry were the listening and viewing audiences. Both networks first began capitalizing on America's growing appetite for realistic crime depictions in 1950. CBS debuted its Somebody Knows series on July 6, 1950, with NBC countering the following day with its Wanted series airing July 7, 1950. John Crosby had long been a critic of the 'radio noir' crime and detective dramas of the 1940s, almost invariably panning the majority of them for their questionable plots and far-fetched and implausible situations. But both Somebody Knows and Wanted seemed to strike the right balance for Crosby. For the Radio audiences of the era, not nearly as much. Though both series achieved respectable ratings during their brief summer runs, neither were renewed beyond their Summer seasons. Both series were more docudramas than dramatizations. For American audiences, both series' remained simply 'a Summer fling' and little more. Dragnet continued to climb the charts and CBS' The Line-Up was gaining both an audience and sponsors. Summertime is, afterall, a time of escapism for most of America. Somebody Knows differed from Wanted by focusing on an unsolved crime of a particularly gruesome or notorious nature. Wanted by contrast focused on the career fugitive. Wanted's thirteen installments traced the 'careers' of criminals who'd acheived the lofty heights of the FBI's infamous 'Ten Most Wanted' list. These were con-artists, repeat prison escapees, and killers of the most notorious stripe. Many of the names were still quite familiar to early 1950s audiences: Willie Sutton, Mikey Melik, 'Two Gun Kinnie' Wagner and Glen Roy Wright in particular. And while many of these desperadoes were more regional sensations in nature, Willie 'The Actor' Sutton and 'Two Gun Kinnie' Wagner had made headlines across the U.S. during their various crime sprees. While Somebody Knows had offered a standing $5,000 reward for further insights into their unsolved crime depictions, Wanted focused only on fugitives either currently or previously at large--with no reward offered other than America's unspoken obligation to assist in the fugitive's capture, or recapture. Wanted's format framed each docudrama with the actual, first person accounts of those involved in the crimes commited by the fugitive at issue. The interviews were intermixed with Fred Collins' and Walter McGraw's expositions to move the dramatizations to their conclusion. At the conclusion of each program, the narrator(s) would provide clues as to the possible whereabouts of the fugitive(s) at large. The circulating exemplars are uniformly taut, well paced and informative, even by today's standards. Dramatizations were kept to a minimum, relying primarily on the first-person accounts and interviews to move the plots along. Morris Mamorsky's scores added to the pace and suspense of each episode, and the expositional writing in support of each episode was both succinct and informative. Both series--Somebody Knows and Wanted--were also examples of series' conceived, shaped, promoted, produced and directed by a single, independent producer for network consumption: Jimmy Saphier for Somebody Knows and Walter McGraw for Wanted. These types of entrepreneurial productions would see far greater exploitation throughout the 1950s, as major networks sought to reduce or restrain Radio production costs in favor of their Television offerings. For Crime fans of the era, Wanted clearly fired the imagination and provided a radio verite realism to each installment rarely ever heard before over Radio. For the sociologist or student of the police science of the era, the surviving exemplars illustrate the evolving sophistication of both criminal forensics and fugitive pursuit technology of the era. 9 p.m.--Wanted (WIBA): new series based on interviews with crime witnesses, police officials; story of Willie "The Actor" Sutton, sought for armed robbery and jailbreak. 9 p.m.--Wanted (WIBA): case against Myron "Mike" Selik, sought for murder of Michigan state senator. 9 p.m.--Wanted (WIBA): Edward Sadowski, sought for Cleveland murder since May 13, 1949. 9 p.m.--Wanted (WIBA): story of "Angel" Fred Tenuto, one of nation's 10 most wanted fugituves. 9 p.m.--Wanted (WIBA): story of Glen Roy Wright, sought for murder, armed robbery, narcotics peddling, prison break. 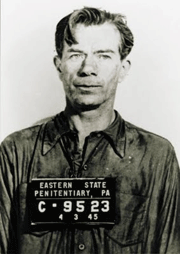 9 p.m.--Wanted (WIBA): Kenneth "Two-Gun Kinnie" Wagner, killer of six. 9 p.m.--Wanted (WIBA): story of Omar August Pinson, killer of Hood River, Wash., police officer. 9 p.m.--Wanted (WIBA): James Joseph Sweeney, for attempted murder and bail-jumping. 9 p.m.--Wanted (WIBA): Two alleged swindlers, Troy Eugene and Thurman Seay. 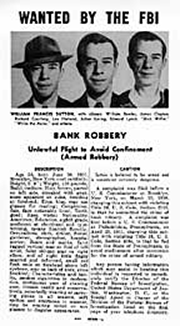 9 p.m.--Wanted (WIBA): Henry Clay Tollett, bank robber. 9 p.m.--Wanted (WIBA): New York hoodlum sought for armed robbery. Fred Collins' unmistakable voice and delivery remained one of the highlights of NBC's offerings during the waning days of The Golden Age of Radio. For fans of X Minus One and Dimension X in particular, Collins' delivery was part and parcel of the entire experience of those remarkable Sci-Fi adventure series'. For fans of Collins' entire radiography, simply hearing his voice seemed to ensure that whatever program he was announcing would be worth a listen, irrespective of the content or format. There's no question that he hitched his star to some winners during the era. Collins' bell-clear delivery ushered in some of the Golden Age's finest and most prestigious offerings over NBC. He was also the NBC announcer most associated with some of the more 'hip' offerings over the years. Programs such as Concert in Miniature (1952), Stars in Jazz (1953), Concert Encores (1953), and My World Is Music (1953) made Colllins a natural to announce the Count Basie, Louis Armstrong, Dave Brubeck, Charlie Parker, and Woodie Herman spotlights of the mid-1950s. Collins' natural rapport with the artists and performers, combined with his own extensive knowledge of the great Jazz and Swing proponents of the era made him an integral element of those productions. This, in an era during which NBC had an embarassment of outstanding announcers on staff. Our personal favorites, in addition to his work on Dimension X and X Minus One and the Jazz and Swing artists he announced for, was his work with Eva le Galliene on New Theater and Ilona Massey on Top Secret. He also got to act occasionally, most notably in an episode of Radio City Playhouse. But he was also a natural element of the many adventure and detective programs he either hosted or announced: The Falcon, Mr I A Moto, Inspector Thorne, and The Chase, among others. Collins rounded out his broadcasting career with NBC on Monitor, NBC's historic, 20-year attempt to extend Golden Age of Radio programming a bit further in an albeit more abbreviated weekend-only format. For NBC announcing staff fans, the NBC Monitor series was Christmas every weekend. And Fred Collins was right there with them to the end.